The NoDong is a medium range ballistic missile indigenous to North Korea. The missile has a maximum range of 1250 km (776 miles), making it capable of striking all of South Korea and Japan. The NoDong is liquid fueled and can carry a payload of 1,200kg. It is likely capable of carrying nuclear warheads. As a road-mobile system, the missile can be launched from any location and is concealable, making it more resilient to a pre-emptive strike. Believed to have been developed in the late 1980s as a part of a Soviet technological transfer, the NoDong is an enhanced version of the Soviet Scud-C missile. However, the development of the NoDong was not entirely an independent North Korean effort, but a collaboration of Chinese and Russian assistance. A derivative of the NoDong was used as the first stage of the long-range Taepodong-1 when it was launched in 1998. Although the rocket failed to reach orbit, the NoDong performed successfully as the first stage. North Korea remains very isolated from the rest of world. This isolation has greatly reduced its ability to bring in revenue. Thus, it relies on exporting ballistic missile systems, technology, and system components as a means of generating national revenue. Accordingly, Libya, Syria, Pakistan, and Iran have been recipients of North Korea’s missile systems. In fact, Iran received about 150 NoDong missiles from North Korea in the late 1990s as part of a technological transfer agreement. Iran later renamed the missile Shahab-3 and developed the capability to produce them domestic. The Shahab-3 bears a close resemblance to the North Korean NoDong as they have high levels of commonality in their structural dimensions and mechanical parts. North Korea has also proliferated the NoDong to Pakistan, which Pakistan later renamed Ghauri. This is also evidenced by the Ghauri’s identical structural dimensions and mechanical parts to the NoDong. Although North Korea has yet to use the NoDong, the missile poses a threat to the Northeast Asia region because of North Korea’s irrational and unpredictable behavior, and its active involvement in missile procurement and proliferation. The NoDong’s 1250 km range holds Japan, South Korea, northeastern China, and parts of Russia at risk. U.S. military installations within this region are also well within NoDong ’s strike radius. In March 2014, North Korea test fired two NoDong missiles into the Sea of Japan. 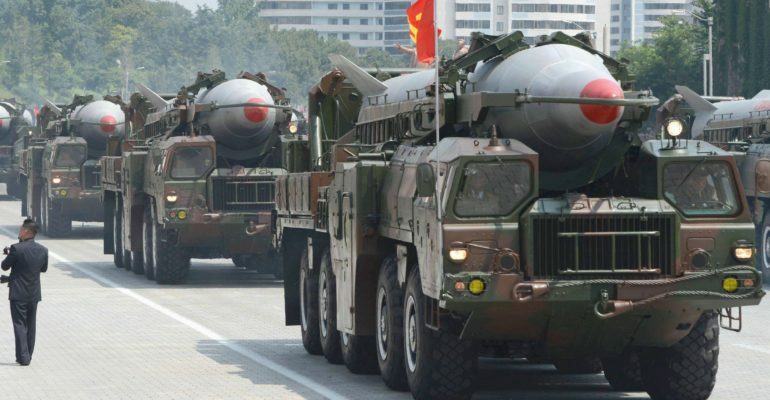 The MRBM is believed to makeup the first stage of the long-range Taepodong missile, which purportedly has intercontinental-range and can strike targets in the United States. Click here to see a list of the NoDong tests. Wright, David C., and Timur Kadyshev. “An analysis of the North Korean Nodong Missile.” Science & Global Security 4 (1994): 129-160. Accessed April 30, 2014.http://scienceandglobalsecurity.org/archive/sgs04wright.pdf. Missile Threat. “No Dong 1 No Dong A.” Last modified October 26, 2012.http://missilethreat.com/missiles/no-dong-1/. NTI: Nuclear Threat Initiative. “North Korea | Country Profiles | NTI.” Last modified March, 2014.http://www.nti.org/country-profiles/north-korea/delivery-systems/. Cordesman, Anthony H. “Iran’s Missile Arsenal and Other Delivery Systems.” In Iranian Weapons of Mass Destruction The Birth of a Regional Nuclear Arms Race?, 109. Westport, CT: Praeger Security International, 2009. Martinez, Luis. “North Korea Launches Two Mid-Range Ballistic Missiles.” ABC News, March 25, 2014. Accessed May 1, 2014. http://abcnews.go.com/blogs/politics/2014/03/north-korea-launches-two-mid-range-ballistic-missiles/.